we recently went to photographer steven lippman’s malibu studio to discuss working together on a kai ad campaign. while looking through steven's photos, which are amazing works of art, the conversation quickly turned from work to steven's most recent passion, the charity near and dear to his heart, A Walk On Water. an avid lifelong surfer and lover of the seas, steven was turned on to A Walk On Water by his business partner and long time surf buddy pat notaro who founded A Walk On Water in september 2012. pat and his hard working volunteers behind A Walk On Water provide water therapy through guided surf instruction to special needs children. the pay off for their efforts on these kids’ behalves became immediately evident as we watched steven's and pat's faces light up as they showed us photo after photo from a recent event benefitting A Walk On Water. seeing these kids smiling ear to ear as they ride a wave in on a long board with their new surf buddy... heartwarming, beautiful, and really hard to express in words. the passion of the guys behind it is palpable and infectious. you can't help but want to help out after seeing the unadulterated joy it brings to these kids and their parents. kai is getting on board, getting involved, and getting the word out that A Walk On Water so richly deserves! how did A Walk On Water come to be? A Walk On Water has been a journey in my own personal life bringing together amazing people. the inspiration began 13 years ago at the 1st annual "pat notaro day malibu surfers healing" aka the world famous malibu surfrider beach. hosted by variety club, the children's charity, the event is a tribute to my father, pat notaro jr., who was an avid malibu surfer, member of the variety club, and sony executive. 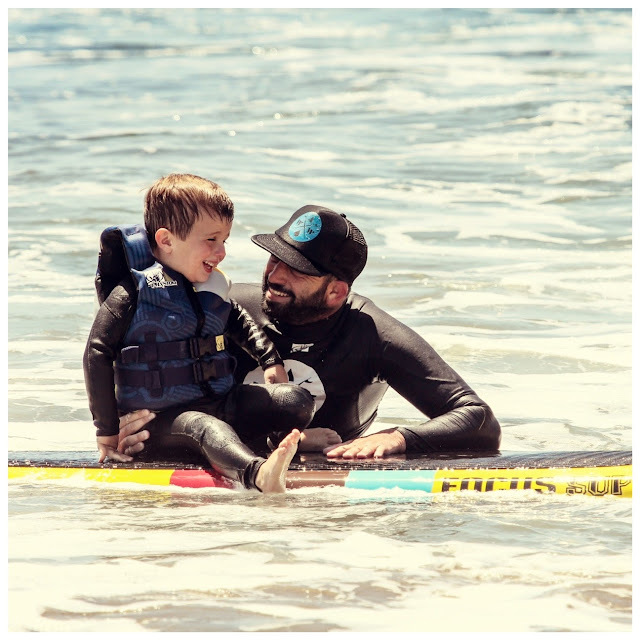 over 200 autistic children experience surfing and the therapeutic qualities of the ocean at these events. the common bond, love for the ocean, and passion for surfing brought our team together and we wanted to create something that allowed all special needs children, including the siblings often shadowed by their special needs brother or sister, to experience both the therapeutic and healing qualities of the ocean. given the opportunity to host our own event at the pristine and private community hollister ranch in santa barbara, california, A Walk On Water was born. the name actually comes from a movie script my late grandfather was going to produce before he passed away. A Walk On Water days are all about sharing moments and leaving the families with an experience. what was your most spectacular moment that came from your involvement with A Walk On Water? it's a series of moments and not just one. but if i had to answer, it’s sharing the gift of giving, the smiles on the children’s and families’ faces, leaving them with an experience. what's the feedback been like from the parents of these kids? let me answer this question from an email sent to steven lippman after an event. first of all i want to thank you with all of my heart for what you did for our daughter, melissa. you see it has been a really rough couple of years for her. everyone has pretty much written her off except for us of course. while at school she had become rather aggressive; having rage episodes that would last for hours. she also stopped eating for over a year; surviving on v8 vfusion juice. we pulled her out of school to keep her at home in a home based program, but her aggression and rages still continued. in the last couple of months she has began eating again, and the only time she seems calm is when she is swimming, which is why surfers healing meant so much to us. she has never been to the camp before (although i had tried for the 4 years prior to this, without success to sign her up) and to be honest i didn't think she would cooperate to get into the water with people who were not familiar to her. you might not remember, but she did refuse to get on her stomach when you first put her on the board, and she remained in sitting position the entire time. she is a very strong willed little girl, as you might be able to tell, but i noticed a rather remarkable transformation while being out on the ocean with you. the experience had such a calming effect on her and she spent the remainder of the weekend so happy, and carefree as if she had been given the best gift ever! we owe that to you. thank you, thank you, thank you for giving our daughter back her smile. kim, todd, matthew, meghan and out little surfer melissa topolsk"
any future events we can help out with? yes, we have a large event planned september 28 at hollister ranch, santa barbara, california and welcome kai. p.s. kai was honored to donate gift bags of kai products to the incredible and selfless moms who devote all of themselves to their kids.